..."recently my daughter was in this play at Saddleback College yesterday, which was an awesome show! 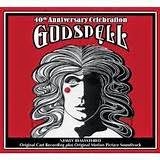 I never heard about this one before, Godspell"! From the 1971 Original Broadway Cast Recording. Music and lyrics by Stephen Schwartz.